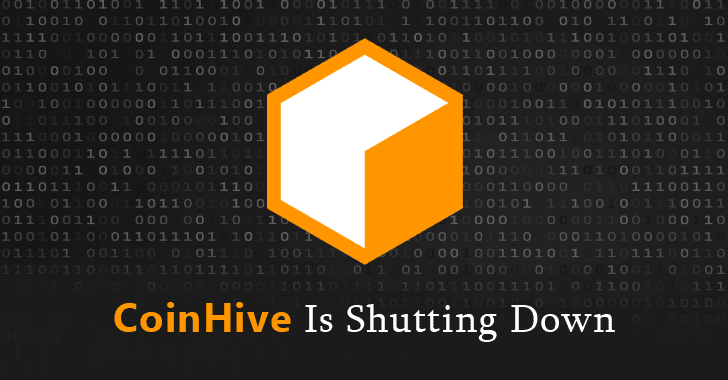 Coinhive, a notorious in-browser cryptocurrency mining service popular among cybercriminals, has announced that it will discontinue its services on March 8, 2019. Regular readers of The Hacker News already know how Coinhive's service helped cyber criminals earn hundreds of thousands of dollars by using computers of millions of people visiting hacked websites. Millions of online users who visited those hacked websites immediately had their computers' processing power hijacked, also known as cryptojacking, to mine cryptocurrency without users' knowledge, potentially generating profits for cybercriminals in the background. Now, while explaining the reason to shut down in a note published on its website yesterday, the Coinhive team said mining Monero via internet browsers is no longer "economically viable." "The drop in hash rate (over 50%) after the last Monero hard fork hit us hard. So did the 'crash' of the cryptocurrency market with the value of XMR depreciating over 85% within a year," the service said. "This and the announced hard fork and algorithm update of the Monero network on March 9 has lead us to the conclusion that we need to discontinue Coinhive." So users who have an account on Coinhive website with above the minimum payout threshold balance can withdraw funds from their accounts before April 30, 2019. Though Coinhive was launched as a legitimate service for website administrators to alternative generate more revenue from their websites, its extreme abuse in cyber criminals activities forced tech companies and security tools to label it as "malware" or "malicious tool." To prevent cryptojacking by browser extensions that mine digital currencies without users' knowledge, last year Google also banned all cryptocurrency mining extensions from its Chrome Web Store. A few months after that Apple also banned all cryptocurrency mining apps from its official app store.